We offer our services with the knowledge that we can and will do the best job possible. You can rest assured that we are experienced professionals and know our work. Got old furniture, televisions, washers, dryers, refrigerators, exercise equipment, mattresses, box springs, auto parts, carpet and padding, hazmat electronic items such as computer equipment and printers, yard waste, plumbing fixtures, sheetrock, plaster, ceramic tile, lighting fixtures, books and all kinds of paperwork, clothes, boats and trailers, pianos, hot tubs, swimming pools? 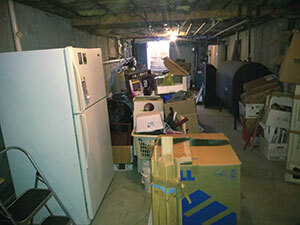 If you no longer want it, our RI junk removal service will come out and get it. Ace Junk Removal specializes in small demolition jobs. Need to get rid of that swimming pool out back, or that hot tub? How about that shed or garage that’s in the way or falling apart? Got a contractor coming in to remodel your bathroom or your basement? The men from Ace Junk Removal will come in with cutting tools and sledge hammers and very carefully take things apart, load the materials into our truck and haul it away to the dump. Best of all we clean up behind ourselves with rakes, shovels, and brooms so that the area is clean and ready for your next project. Ace Junk Removal will come out to your home, apartment building, or business operation on a daily, weekly, or as an on-call operator to remove your trash and garbage. Our trucks are small enough to get into those narrow driveways that the big hydraulic compacting trucks can’t. Any barrel type container that you or your tenants use is fine with us. We empty the containers into our truck and put them back right where we found them. We can take those pesky bulk items, like furniture, that tenants consistently leave behind. Contact Us Now! Quotes are free! General junk, and a lot more. We wanted to let you know that we offer the best services in southern New England. And we cost less than our competitors.